The term society is attributed to a group of people or individuals. If these individuals better themselves only then shall they be able to contribute positively to the society. According to Bhagawan Ramana, unless an individual under goes a self-reform he cannot do social reform.The institution called society has no relation with the rules of conduct. In this infinite world, the society keeps changing with time. Therefore, the rules of conduct also undergo a change with time. But the real or ultimate truth does not change even with the passage of time or changes in the world. Modesty is the ornament that adorns a society. Modesty gives a person immense strength. What is required is not making efforts to help our fellowmen, but revere them. This is possible only if a person is modest and has patience. control the senses and the mind. My journeys to Nannagaru there after was a divine revelation. I would be with him on the day of his arrival in Thiruvannamalai without knowing about his travel, for there was no communication what so ever. 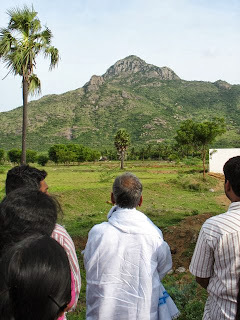 The day he reached Arunachala, an irresistible temptation to leave Chidambaram and travel would make me pack my clothes and leave, not knowing how many days I would stay. Each travel unveiled a new experience. The Glory of divine plan in various forms. Initially I didn't know how to travel there. I was told there was no train service, nor direct bus. As I didn't know Tamil and couldn't read the place of destination, I had difficulty in making enquiry. The first time that I traveled to Thiruvannamalai was very tedious for I had to change buses in three places not knowing for sure if I was on the right path. I would accompany Guruji with other devotees to Ramana Ashram for breakfast and meals. Most of the times I would be right beside him, for the world would be zeroed down. I can't remember any other faces besides his for my whole focus was him and him alone. He would glance into my eyes for long and time would be held still. He would offer me half of what was served to him including his coffee. I wouldn't realize what I was eating for I would be chocked in his love and gulped food with tears most of the times. I feel I was walking with heaven on Earth. I would always recollect this English number, What if God was one of us!! What a blessing it is to be in the presence of a realized master. My world was revolving round him. His compassion was amazing and out of the world. 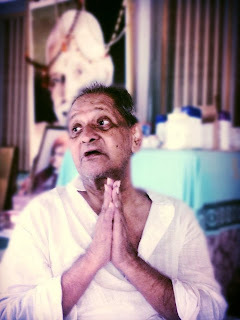 His teachings of Ramana, Buddha, Jesus, Rama Krishna and many others were so profound.I always felt he was not one saint ,but was reflecting every saint he was talking about. It makes us realize one realized master is no different from the others except in expression. Years later it dawned upon me that his love was transforming me, without me being aware of it. So is it to all the others that have the fortune of meeting him. I've heard many devotees both Indian and foreign having their own blissful experience in his presence. - Oneness is Truth, duality an illusion. - God is good God is great. - There are many paths leading to truth. Each one is unique. - One word, one loving glance, one touch, and being in the memory of Guru is enough for our lives to be transformed. - One divine virtue when practiced sincerely will be sufficient for the rest will follow spontaneously. - You are not the body, you are not the mind, Supreme self you are. - We are not here to eat and sleep but to realize the supreme state. That Blissful state of which the angels are jealous of. - Means are varied. Karma path, Bhakti path, Jnana path and dhyana path. Sweetest of all is surrender in which you leave all your worries and responsibilities to a higher power. The path of surrender is like a mother cat holding it's kitten in the mouth to carry it. So the baby has no hassles . Jnana path is like that of a baby monkey holding to it's mother, the baby could slip if it is not cautious. Surrender is sweetest and safest. - Enquiry is a short cut way to get back to source but if negligent might cause harm. But our path depends on each ones mental make-up, so never imitate others.follow what best suits you.It doesn't matter how long we travel.But it is important to be in the right one!! It is important to be on the right path. - In the words of Abraham Lincoln:I am a slow walker but I shall never look back.